It seems like forever since I last posted! I have been busy. I sold the Macomber. 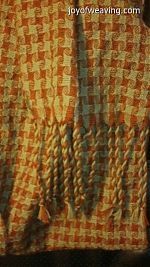 Although I loved weaving on it, it was too tall for me and I dreaded having to do the tie-ups. I can't get on and off the floor so easy anymore. I'm still looking for the elusive 36" 8 shaft Harrisville Designs Loom but, in the meantime, to satisfy my addiction, I acquired an 8 shaft Pendleton. It's a nice little low castle loom and it fits me well. 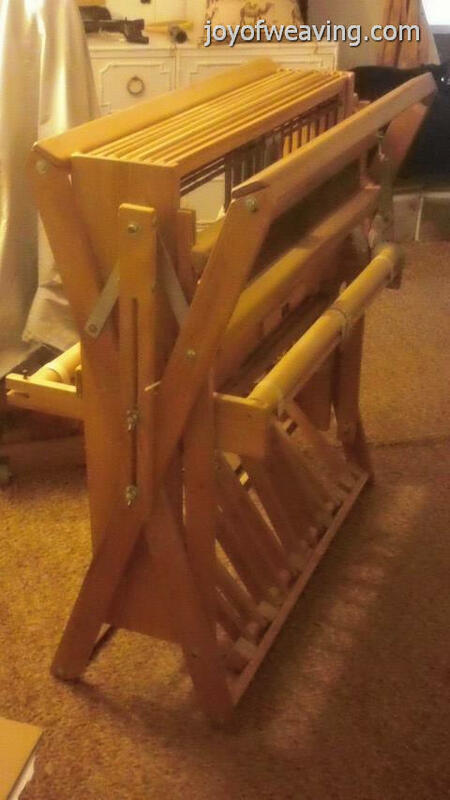 I probably paid too much for it as it needed cleaning up but it came with a very nice double ended bobbin winder and an entire host of Pendleton newsletters. It was stored in a garage and I broke my own rule of not bringing a flash light to check for rust and as the weather was really cold and rainy, I didn't want to take time to have them open it up so I could try it, so I took my chances and brought it home. As we got closer and closer to home, this is what we ran into. ...and it needed work. 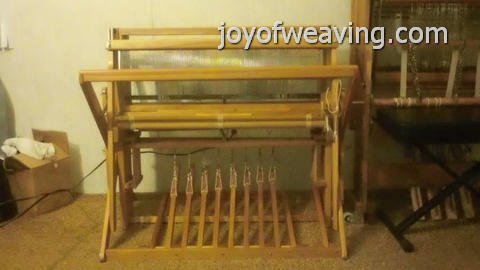 The heddle bars were all rusted, the reed was rusted and it only came with 16 tie up cords. The hooks on those were all rusted too. 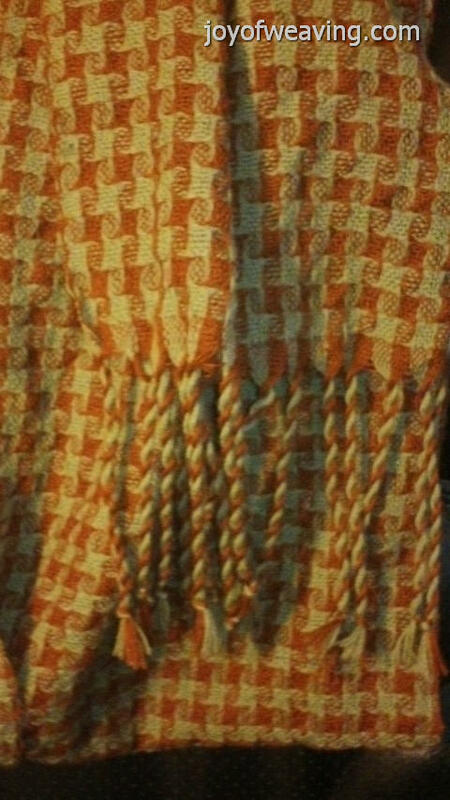 These tie ups are specific to this loom. They're not being made anymore, so it's not like I can just run out and get new ones. I would have to make them. I first spotted the chain at Home Depot. I got black chain thinking that I'll use purple cord with it. No cord. No hooks. No crimps. Headed to Lowes. Nope. Headed to Wilco. Nope. Headed to Michael's craft store and voila. 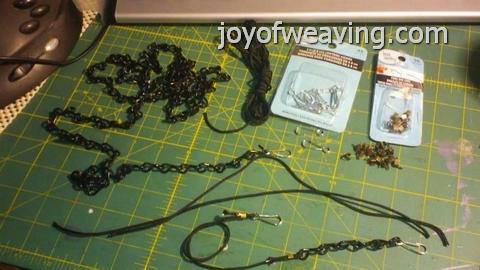 Lanyard hooks, crimps and paracord from the jewelry department fit the bill. Except for the color. I really wanted purple and they didn't have any so I chose black to go with the black chain. Then I figured I'd just use the black on the odd treadles and the original white ones on the even treadles. Ying and Yang. There's not a lot on the internet regarding these looms so I thought I'd share what I have here. First, there is a definite top and bottom to the shafts. The bottom of the shafts are slightly rounded so that they fit in the curve of the jacks and the tops are flat and squared. 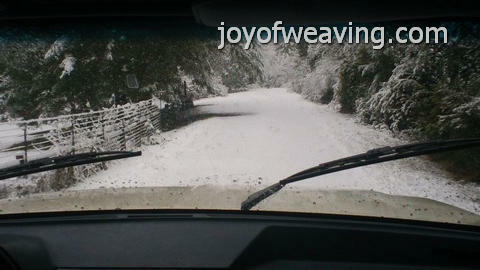 They take 9 1/2" (9.5") heddles. Of course this came with only 500 heddles and HDs take 10.5" heddles. Since what I really want is an HD, I'm not inclined to purchase more heddles so will try and work with projects that don't exceed 500 ends. The tie ups are the strangest that I've ever seen, however, they are quick and easy. Tons easier than the Macomber I had. 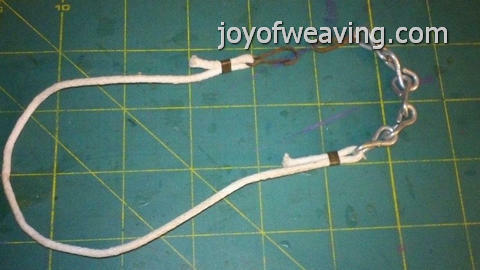 It helps to tip the loom over for easy access to the treadles. You can find the original instructions HERE Enjoy! To test her out and get a feel for it, I chose to weave a pinwheel pattern in brown and light green wool. She weaves really well. 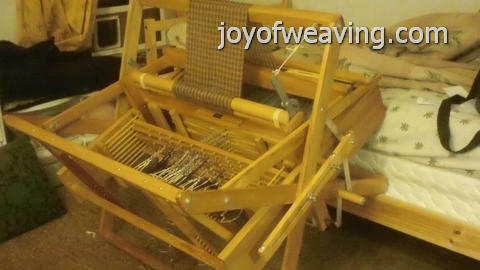 If not for the fact that this loom is only a 30" weaving width with a closed ended beater, I would keep it. What I really want a 36" 8 Shaft Harrisville, so shall keep looking. Hi I just got the 4 shaft I found instructions. But I’m having trouble with the tie ups to the peddles. I’m new to 4 shaft. If anyone can help me I would appreciate it. Hi, I have the 4 shaft model of this I think. I would really like the original newsletters too. Is there any way I could get a copy? I also have the 4-shaft model, 36" wide. Hardly a mention of this brand on-line! Mine is pretty worn and fragile. Hello. Was wondering if you still have this loom and the original newsletters. I would be very interested in them. Sorry for taking so long to get back to you. I no longer have this loom, but I still have the original Newsletters.